It’s true, isn’t it? In this electronic age, it’s far easier to reach for the smart phone and tap out a text than to phone a friend, never mind to sit down and write a letter. Time is compressed during the busy week, and quiet talks, walks, a moment shared over a cup of tea—once easily slipped into our day—have become difficult. When we do have time for a phone call or a visit, we surreptitiously glance at our watches. Time is running… and so are we. Perhaps it’s true that this century, so different from its slower-paced predecessors, leaves little time for the things that used to matter. Not that all changes are bad—far from it. The lives of women have become enriched by possibilities that did not even exist when I was younger. One friend’s daughter will soon begin her internship and become a pediatrician. Another’s is a fine psychologist, and a third’s grand daughter is studying law. Our daughters in law have fine, rewarding careers. And men’s lives, too, have been made more meaningful as the genders reach across to each other in equality and with even more respect. So, change is good. But some things do not change. Though the times around us move to a faster beat, the rhythm of our own hearts has not altered. The need for contact, the reach for support, the yearning for love and acceptance is within us all, as much a part of us as blood and DNA. Which was more special? The gift, the memory, or the caring that went into the making of that quilt? Probably all three, the last being at least as important as the others. For no matter how much the times changes, our world is still turning, and it will always turn better for friendship and love. I really liked this blog. It reminded me of the relatives I have lost and of the quilt I have of my grandmother’s. I don’t use it, but have it tucked away. I do miss the slower pace we enjoyed as children and the times I spent on my grandparent’s farm with no TV and no telephone. I became very nostalgic! Point taken! I do love many of the ‘modern’ conveniences, true. But the old days were nice, too. Getting old, I guess! I love the quilting story and the reminders to find time to make personal connections through calls, letters, and visits. During my husband’s present illness, we have had much attention from family and friends. I’m thankful for each gift of time–especially the prayers. Improved health is seen each day. These connections are priceless. Thank you for reminding us how important it is to stop and be “caring” toward each other. And the quilt is beautiful. Thank you so much, Linda! 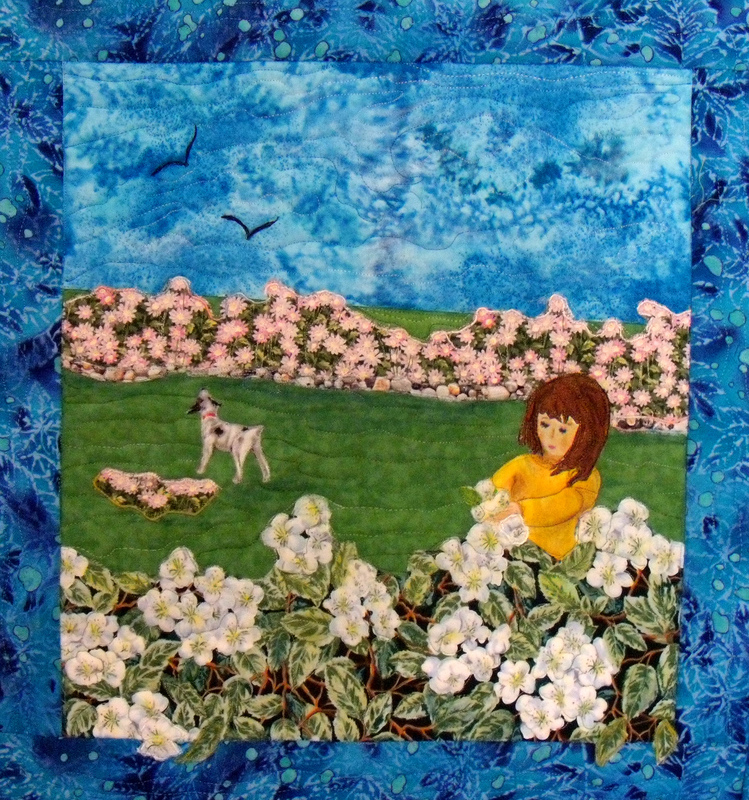 The quilt was inspired by our younger grand daughter… I loved making it! I am so glad that your husband’s condition is improving! One of the nicest things about these busy modern times is the leaps that have been made in the medical field… you are always in my thoughts. How to take from what is new, better yet different that enhances our lives and our loved ones and how to salvage and treasure the gifts of the past — be they tangible objects, communications, or memories? You have managed to hone in on some of what we must savor expecially as we reach our later years. It is so important to share with children and grandchildren what has been most meaningful in our lives in the hopes that they too will be able to grasp and hold on to what and who are most significant. Indeed, Fran… well said! I wonder, sometimes, what we do leave behind… Hmm. Another idea! Miss you. As usual, a nice post Maureen. The quilt is lovely and very artistic. Happy Easter, Sarah. Thank you, Sarah… And I hope that your Easter was a wonderful one! That is a beautiful quilt picture. I hope you had a great Easter. I surely did. Thanks for being my friend. Thank you so much, Joan! I hope that your Easter, too, was a wonderful one. I am saving all the cards my children and grandchildren have sent to Al and I thru the years. I hope they will read these after I am gone and remember all the good times that were expressed in these cards. Love you quilt as usual!